We’ve dedicated the month to reducing the risk of a heart attack or stroke by promoting heart healthy eating, exercise and lifestyle tips. However, another potential lifesaver is the ability to recognize the signs of a stroke or heart attack so that swift action can be taken immediately. 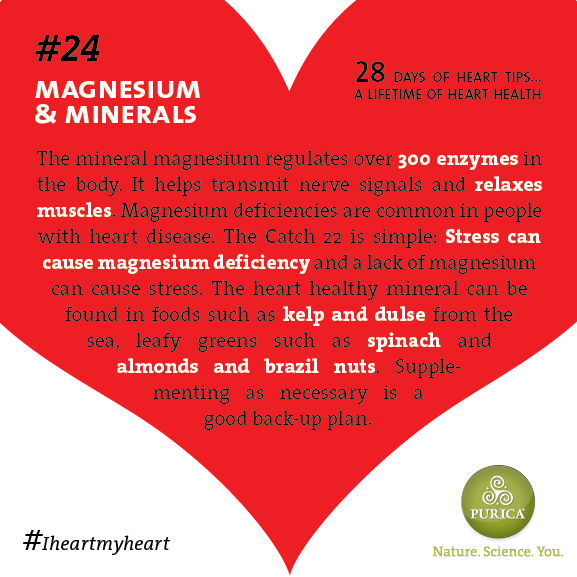 The key is readily recognizing warning signs such as chest pain and shortness of breath. 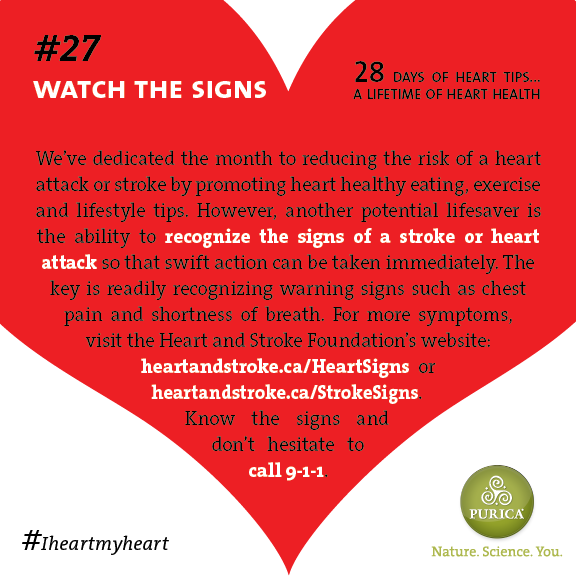 For more symptoms, visit the Heart and Stroke Foundation’s website:www.heartandstroke.ca/HeartSigns or www.heartandstroke.ca/StrokeSigns. Know the signs and don’t hesitate to call 9-1-1. We’ve encouraged you to consider walking, circuit training, yoga and biking as among the best forms of physical activity you can do for your heart. If you’re looking for the biggest bang for your buck, it might be swimming. It gets all of the major muscle groups involved, emphasizes steady and deep breathing and gets the heart pumping without jarring impact. Research also shows that the buoyancy of being in the water triggers relaxation for most people. If you’re on target for 30 minutes of exercise five times per week, make a trip to the pool as part of your plan. Several studies suggest that a positive outlook reduces stress in the body and that happy people are more inclined to eat well, exercise more, sleep better and overall make healthier lifestyle choices. 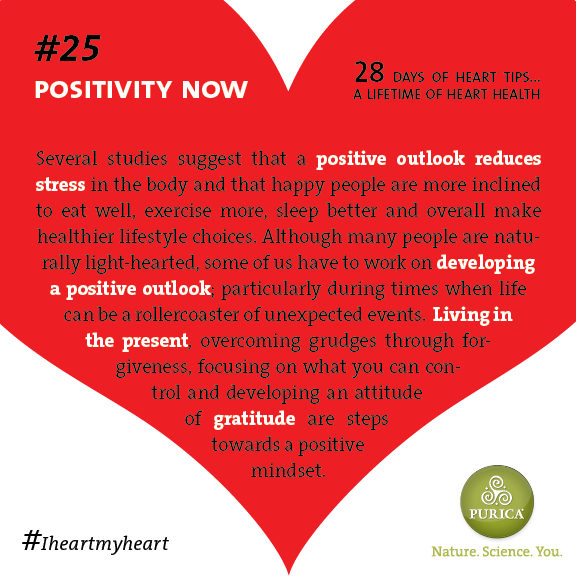 Although many people are naturally light-hearted, some of us have to work on developing a positive outlook; particularly during times when life can be a rollercoaster of unexpected events. Living in the present, overcoming grudges through forgiveness, focusing on what you can control and developing an attitude of gratitude are steps towards a positive mindset. 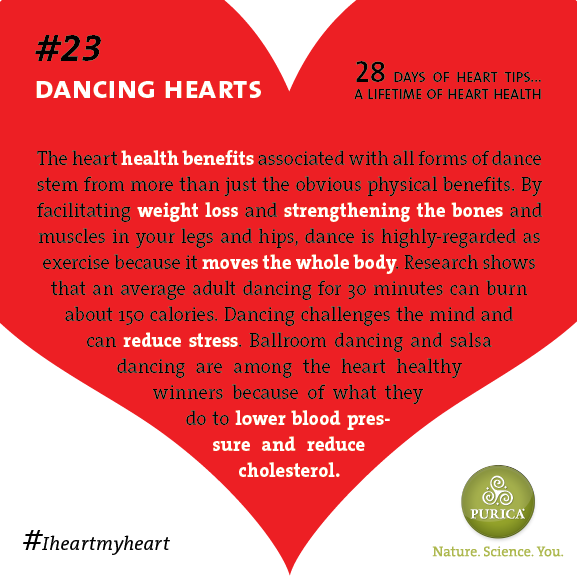 The heart health benefits associated with all forms of dance stem from more than just the obvious physical benefits. By facilitating weight loss and strengthening the bones and muscles in your legs and hips, dance is highly-regarded as exercise because it moves the whole body. Research shows that an average adult dancing for 30 minutes can burn about 150 calories. Dancing challenges the mind and can reduce stress. Ballroom dancing and salsa dancing are among the heart healthy winners because of what they do to lower blood pressure and reduce cholesterol. While aerobic exercise has typically been perceived as essential to cardiovascular fitness, weight training – anaerobic exercise — has also demonstrated benefits. Weight training produces a widening of blood vessels in response to increased flow, one of the key contributors to heart health. Although it can cause small increases in arterial stiffness, research on weight training showed greater increases in blood flow compared to cycling. 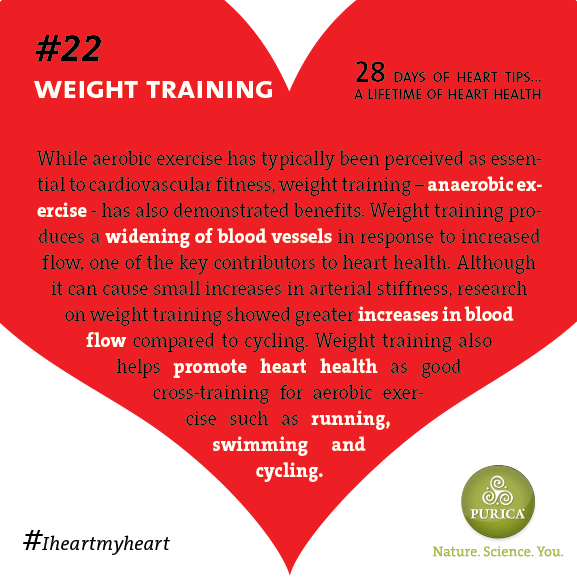 Weight training also helps promote heart health as good cross-training for aerobic exercise such as running, swimming and cycling. Not all fats are created equal. Avocado for example is a superfood winner because it has monounsaturated fats and no cholesterol or sodium, while being packed in nutrients. Other healthy options include egg yolks, olives, nuts and seeds. The bottom line is that a balance of healthy fatty acids is essential to optimal health. When it comes to fats, avoid denatured and unstable fats and incorporate natural whole foods. Avoid vegetable oils used in deep frying; they’re often reheated and subject to becoming rancid. Hydrogenated fats such as certain margarines or shortening contain trans fatty acids, which research suggests raises your bad cholesterol (LDL) and lowers your good cholesterol (HDL). Your blood sugar level is the amount of glucose in your bloodstream at any given moment and balancing it regulates hormones, increases metabolism and helps burn stored fat. Two of the smartest ways to achieve healthy blood sugar levels are: 1. Trying to eat a balanced meal of proteins, fats and carbs at each meal; and 2. Ensuring that you don’t go too long between meals, especially at the start and end of each day. The heart healthy rule of thumb is eating every three hours to keep your blood sugar levels in check. You don’t want them to ever get too high nor too low. 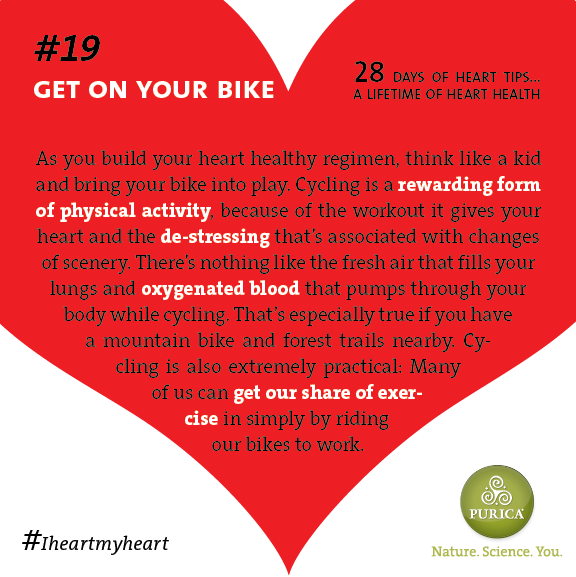 As you build your heart healthy regimen, think like a kid and bring your bike into play. Cycling is a rewarding form of physical activity, because of the workout it gives your heart and the de-stressing that’s associated with changes of scenery. There’s nothing like the fresh air that fills your lungs and oxygenated blood that pumps through your body while cycling. That’s especially true if you have a mountain bike and forest trails nearby. Cycling is also extremely practical: Many of us can get our share of exercise in simply by riding our bikes to work.